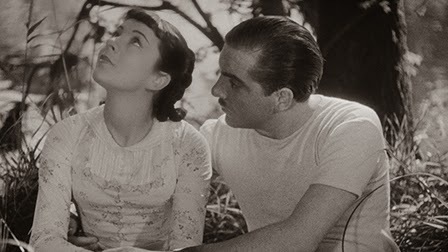 Jean Renoir's “A Day In The Country” (“Partie de campagne”, 1936) has its legion of devotees, finishing in the top 100 in the most recent “Sight & Sound” critics poll. While it is undeniably beautiful and sometimes downright breathtaking, I wonder how much the film's support owes to its unique and tenuous place in the oeuvre of one of cinema's most-respected masters. Long before the omnibus film ever became a thing, Renoir, still in the early stages of his extraordinary career, concocted the bold plan to mount a short film with all the care and attention normally lavished on feature films and with an eye towards eventually teaming it up with two other shorts for a full-length theatrical release. Logically enough he decided to adapt a Guy de Maupassant short story for the start of this project and began shooting in 1936. Problems mounted quickly during production, including a national workers' strike and some of the most torrential summer rain the area had witnessed in years (put to good use in a gorgeous scene of brewing storm clouds and flooding waters). The subsequent delays forced Renoir to abandon the film for a prior obligation (his next movie “The Lower Depths”), leaving his cast and crew high and dry and the film both unfinished and unedited until after the war. By that time Renoir was working in America and had all but forgotten about his day in the country, but Marguerite Houlle Renoir (the director's lover through most of the '30s) and her sister Marinette Cadix edited the footage, and producer Pierre Braunberger (a Jewish man forced into hiding during the Occupation) released the film at Cannes and then later to the French public in 1946. Though accounts have differed over time, Renoir may well have been unaware of any of these developments until after the film's release. Supposedly he did not even see the final cut until 1950. He must have been surprised at how good this long-abandoned experiment turned out to be. The story, set in 1860, is quite straightforward. M. Dufour (Andre Gabriello), a Parisian shopkeeper, takes a weekend trip to the countryside for a picnic with his wife (Jane Marken) and daughter Henriette (Sylvia Bataille) with the daughter's foppish paramour Anatole (Paul Temps) in tow. The arrival of the city folk is met with contempt by the rural locals (“Parisians are like germs!”) but contempt turns into passion once two amorous young men, Henri (Georges D'Arnoux) and Rudolphe (Jacques Brunius), get a good long look at the ethereally beautiful Henriette gliding through the air on a swing. Ah yes, surely the film's signature image. 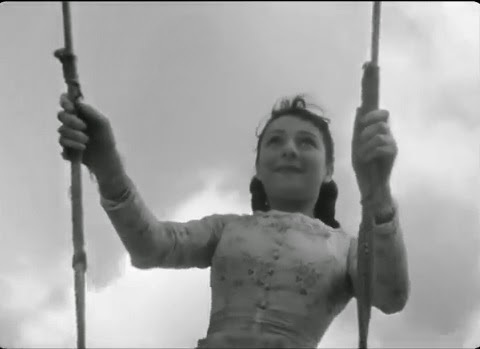 With the camera mounted directly to the swing, Bataille's beatific face becomes the fixed center as the sky and countryside whirl by in the background, a vertiginous effect that captivates both the audience and the city girl. She is intoxicated by the sights, sounds and smells of nature: the placid rippling of the Seine, the trill of hummingbirds, the redolent plant life spurting along the river banks. She is primed, then, for seduction by the very grabby hands of Henri and he takes full advantage of the situation with nature as a vocal witness to their love, the sky erupting and the river swelling in the immediate aftermath of their tryst. The film maintains its sensuous quality throughout its brief 41-minute run time but its abrupt ending (partially explained by Renoir's departure) leaves it feeling somewhat slight, at least to me, and I find Henri's insistent groping despite repeated brushoffs more troubling than I suspect I am supposed to. However, even a truncated finale contributes to the sense that “A Day In The Country” is a gossamer creation that has somehow weathered storms and wars and decades and even abandonment by its creator to survive with all its luminosity intact. That makes it a particularly precious relic to its admirers, and the fact that it's difficult even to label it fully as a Renoir film renders it, in an odd way, one of Renoir's most important films. That it provides his most obvious effort to address the works of his father, the legendary impressionist painter Pierre-Auguste Renoir, only solidifies its place in the canon. The film is presented in its original 1.37:1 aspect ratio. This is a very bright sunlit film for the most part and it can occasionally be difficult rendering such brightness in a digital transfer. In general, the image detail is sharp with a strong grainy texture but there are moments when the image gets ever so slightly washed out. In outdoor scenes you won't always be able to pick out each blade of grass the way you can on some of the sharpest high-def transfer, but close-ups look good and the transfer does fine job of conveying the insistent force of nature in this setting. The linear PCM mono track has more problems than the image, mostly owing to the film's difficult production history. The problems aren't significant, just a hollowness to the audio at times and occasional slight dropoffs. Overall it's still a solid mix, as good as can be expected from the source material. Optional English subtitles support the French audio. “A Day In The Country” may not run long, but that hasn't led Criterion to cut the extras short. First up is an introduction by Jean Renoir from 1962 (6 min.) in which he discusses his early plans for an omnibus film and extols the virtues of plagiarism. Like most worthwhile directors, he believes the story is not important, only how it is told. “The Road to 'A Day In The Country'” (2014, 214 min.) is an interview with Renoir scholar Christopher Faulkner who brings an extraordinary amount of expertise and background information to the table. It's difficult to imagine a 24-minute interview that packs in more valuable information. I wound up taking a full page of notes but I think it's best to let you enjoy this on your own. I hope Mr. Faulkner is invited back to Criterion many times, this is just fantastic. The disc also includes an excerpt (5 min.) from a 1979 documentary about producer Pierre Braunberger which isn't too substantive but still of some interest. 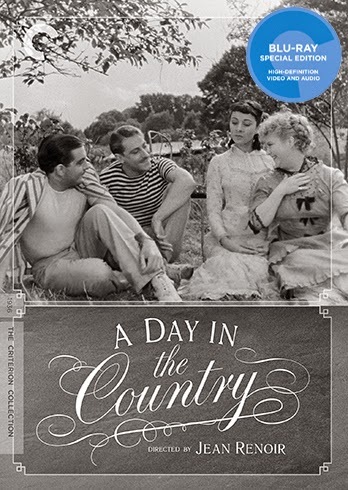 In 1962, the Cinemathèque française was given four-and-a-half hours of outtakes from the filming of “A Day In The Country.” A mere 32 years later they produced an edited 89-minute feature from these unused scenes called “Un tournage a la campagne” (1994). The excerpts were chosen and edited by Alain Fleischer. That entire feature has been included here along with a separate collection of Screen Tests (9 min.) that were also given to the Cinemathèque, one of which is a brief snippet of Renoir (who appears briefly in the movie as an innkeeper) mugging for the camera. As an accompaniment to this impressive feature Criterion has also included the piece “Renoir At Work” in which Christopher Faulkner analyzes some of the outtakes with an emphasis on undermining the long-standing notion (promulgated by the Cahiers critics) that Renoir employed a great deal of improvisation. Faulkner argues that the excerpts provide evidence instead of meticulous planning at every stage. The slim foldout insert booklet includes an essay by film scholar Gilberto Perez. This modest little film's existence is unlikely enough; its release in beautiful high-def with a bevy of extras is a reminder that we live in a unique time for cinephiles.